The major chunk of Cravatex's business comes from Fila, the 1911-founded Italian sportswear brand that is now owned by Yoon-Soo Yoon, who was once its Korean licensee. We will never be able to match the might of the big boys, but there will always be a niche." Rajesh Batra has always been practical. Whether it is now, when he talks of sportswear brand Fila - his company Cravatex is its official distributor - and how it is up against the likes of Nike, Puma, Adidas and Reebok. Or whether it was 37 years ago, when he quit professional tennis to join his father's business. He was merely 22 then, and he had achieved a rank of No. 6 in India in the early 1970s. But that wasn't good enough for him. "I figured that unless you can make top 50 in the world, there's no point in playing," reminisces Batra, now Chairman and Managing Director of Cravatex. And that, he reckoned, was a tall order. The past three years leading to March 2014 have been particularly good, with its top line growing at an average 28 per cent to Rs 189.4 crore in 2013/14. 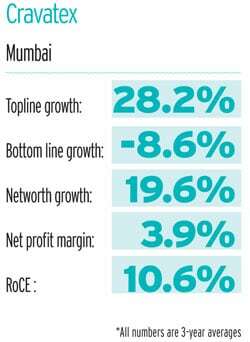 While net profit has been low (Rs 4.12 crore in 2013/14) and slipping (three-year average growth of negative 8.6 per cent), net profit margin has averaged 3.9 per cent over the past three years. The major chunk of Cravatex's business - more than Rs 100 crore - comes from Fila, the 1911-founded Italian sportswear brand that is now owned by Yoon-Soo Yoon, who was once its Korean licensee. Cravatex has the licence to sell Fila products in India and other countries of South Asia. A leading sports brand in the early 1980s, Fila is still strong in places like China and Hong Kong, but has negligible presence in India. And that too has come about only since 2010, when Cravatex signed a five-year licensing deal with Fila, and followed up with a really long-term, 30-year deal in 2013. "I told the brand owner that if we have to be relevant, we have to think long term." It worked, and Batra is hopeful of taking it further, though he still remains grounded. It's not difficult to understand why. Having started late, Fila has just 35 stores in India - 17 are rented and run by Cravatex; rest franchised - whereas the likes of Nike, Adidas, Puma and Reebok have stores in the hundreds. Then, brand Fila is not consistent across countries - so consumers who travel abroad find a different Fila in India from, say, the US or China. That is because Fila's licensees are free to themselves design and manufacture sports shoes, apparel, etc., after taking approval from Fila's design centre. "We buy some things that are standard throughout the world," says Batra. "Fila is known for tennis, skiing - so tennis products we carry what the global line is. But otherwise you've got to tailor-make to local preferences." In fact, Fila licensees across countries can also buy from one another if they like a particular product. "Especially in apparel, Cravatex is one of the most innovative partners we have globally," says Jon Epstein, a Fila board member and President of Fila US. "Most recently we launched a massive programme with Urban Outfitter, one of Americas most trendy retailers. The product is selling with great success." Eighty per cent of Fila sales for Cravatex in India are sports shoes, which it imports from Fila-approved factories in China. Fila-branded apparel and slippers are outsourced to Indian factories. Batra, of course, feels that Fila having 35 stores is the biggest upside to Cravatex, because once he takes the stores up to about 150, it will drive profit growth for the company. To that end, over the next 3-5 years, Batra wants to increase apparel's share in Fila sales from 15 per cent to 35 per cent, because "margins are better on apparel. Secondly, it's made domestically so you don't have the exchange rate fluctuation problem". He is betting on both online and offline retail for growth. Currently, 20-25 per cent of Fila sales comes from online. "There is huge scope online - they (Amazon, Myntra, etc.) are growing phenomenally, and we are growing with them," says Batra. "Offline players are also expanding. Reliance Footprint is opening stores, Metro Shoes, Planet Sports, Shoppers Stop, Lifestyle - as they open more stores, we grow with them." In the fitness business, Cravatex has approached Johnson Health Tech with the idea of setting up manufacturing in India, as that would help Johnson diversify its manufacturing, and also make it more economical for Cravatex. Currently, Cravatex sells Johnson treadmills and other fitness equipment at 50 Proline Fitness stores across India. It also employs 110 engineers to provide after sales service to customers - including gym chains like Talwalkars and Gold's Gym, housing societies and others. Batra is hopeful of growing Cravatex's businesses by 15-20 per cent each year. That is not way off the mark, considering that a report by Images F&R pegged the Rs 6,000-crore sportswear market in Indian to be growing at 13 per cent annually.